This article is written by John C. Cannon. The world’s newest orangutan species is also one of the most threatened. According to a new study, the Tapanuli orangutan, one of only seven species of non-human great ape alive today, faces serious threats to its survival as infrastructure development and agriculture threaten more than one-quarter of its habitat. In November, a team of scientists reported that a new species of orangutan living on the Indonesian island of Sumatra was distinct from Sumatran and Bornean orangutans. They believe that fewer than 800 Tapanuli orangutans survive. Conservationists and scientists warn that a proposed 510-megawatt hydroelectric dam could push the new species closer to extinction. Even as scientists introduced the world to a new species of orangutan in 2017 — one of only seven non-human great apes alive today — they were already working to pinpoint the threats that might lead to its demise. In a new study published today in the journal Current Biology, a team of scientists reports that road expansion, agricultural conversion and a planned hydropower project could destroy more than one-quarter of the Tapanuli orangutan’s existing habitat. With no more than 800 individuals, the world’s rarest ape species could face extinction not long after we became aware of its existence. “In forty years of research, I don’t think I’ve ever seen anything this dramatic,” said William Laurance, a tropical ecologist at James Cook University in Australia and the team’s leader, in a statement. 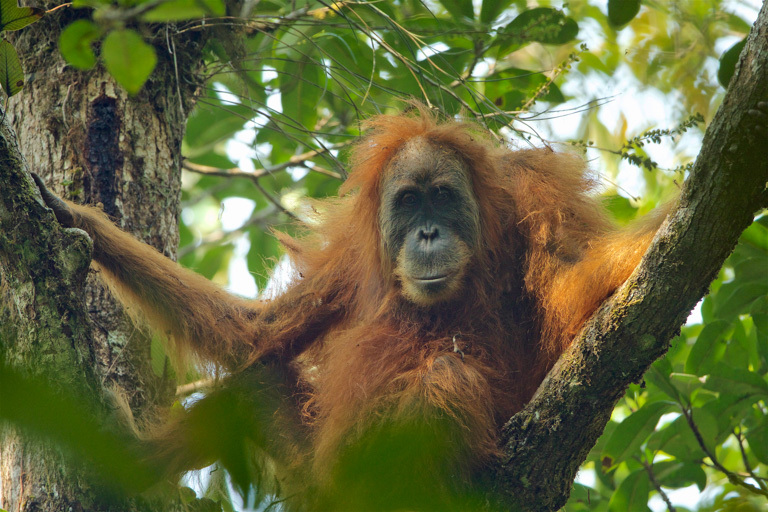 A male Tapanuli orangutan in the Batang Toru forest. Image by Tim Laman via Wikimedia Commons (CC BY 4.0). In November, a different group of researchers concluded that orangutans living in the Batang Toru region should be considered a new species, Pongo tapanuliensis. Based on the differences in their behavior, genetics and morphology, the Tapanuli orangutan is distinct from its cousins living in the rainforests of Borneo (Pongo pygmaeus) and elsewhere in Sumatra (Pongo abelii), they argued. Around the same time, Laurance and his colleagues had created detailed maps of the road network across northern Sumatra, including the forests of Batang Toru, part of a broader effort to map both infrastructure projects and targets for conservation across Southeast Asia. They decided to use those analyses to explore the impact the existing — and future — infrastructure developments might have on the Tapanuli orangutan. “It just seemed like an obvious thing to do,” Laurance told Mongabay. They found that planned developments pose a serious threat to this species’ survival, not to mention that of other animals such as the critically endangered Sumatran tiger (Panthera tigris sumatrae). 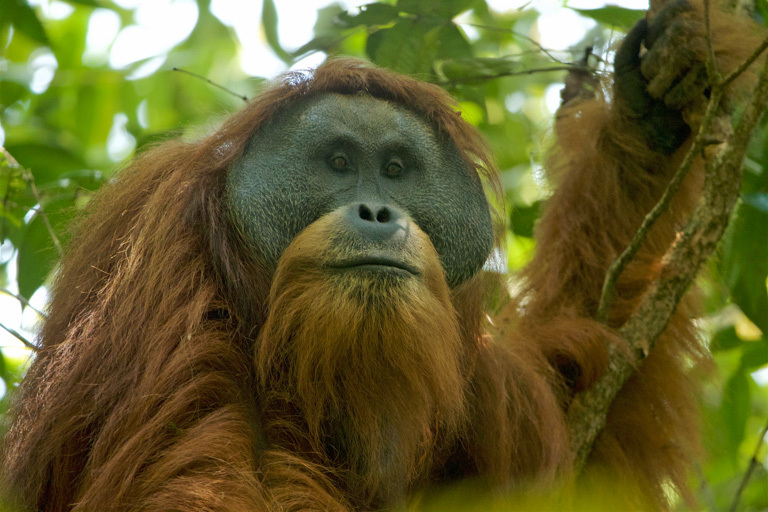 The forests that are home to the Tapanuli orangutan are split into eastern and western “blocks,” along with the Lubuk Raya reserve, creating three isolated populations. What’s more, about 5 percent of the remaining numbers live in the Dolok Sibual Buali reserve, linked to the western block by a sliver of forest only about 700 meters (2,300 feet) wide. This corridor, as well as a sizeable chunk of the eastern block of habitat, have been zoned for oil palm and other types of agriculture, putting around 14 percent of the species’ total habitat in danger of development. Splitting the already-disjointed orangutan populations into smaller and smaller pieces will increase the chances of problems like inbreeding and accelerate the species’ slide toward extinction, the authors write. But the most pressing threat looming over these orangutans is a proposed 510-megawatt hydroelectric dam. “It’s right in the core habitat,” Laurance said. Based on the team’s analyses, they figure the project would dramatically change 96 square kilometers (37 square miles), or about 8 percent, of the animal’s range in the next four years. The dam’s construction would inevitably carry with it a suite of ancillary impacts, such as the access roads that crews will build and the pathways for power lines that they’ll have to carve through the forest. Such openings into the forest increase the odds that farmers will clear more land for agriculture or hunters will enter the area. Conversely, restoring forest at the proposed site of the dam would create a few narrow corridors that could reconnect the eastern and western populations and boost the species’ chances of survival, Laurance said. Despite these concerns, the project continues to move forward. Laurance said that he received confirmation that the World Bank has decided not to help fund the $1.6-billion project, likely because of the potential environmental damage. But the Bank of China has pledged financing for the dam, and a Chinese-state-owned hydroelectric company called Sinohydro has signed on to handle its construction. Bornean (left), Sumatran (middle) and Tapanuli (right) male orangutans. Image by Eric Kilby, Aiwok and Tim Laman via Wikimedia Commons (GFDL). Wich was not involved in this research, but he was a coauthor of the paper announcing the new orangutan species in November. He urged the dam’s developers and representatives of the Indonesian government “to have a sensible discussion” about alternatives for generating power in this part of Sumatra. In the same vein, a growing cadre of scientists and conservation organizations, led by groups like the Sumatran Orangutan Conservation Programme and the Sumatran Orangutan Society, are campaigning for a change in the project’s course. But if that doesn’t happen, the dam would be “the beginning of the end of this species,” Wich said. He said that little beyond the “extreme conservation” approached used in shepherding Africa’s mountain gorillas (Gorilla beringei beringei) back from the brink of extinction, such as near-round-the-clock surveillance by armed guards, will keep the Tapanuli orangutan from disappearing forever. An adult female Tapanuli orangutan. Image by Tim Laman via Wikimedia Commons (CC BY 4.0). Laurance and his colleagues agree, arguing in the paper that the government should protect every bit of the animal’s remaining habitat without hesitation. Banner image of an adult female Tapanuli orangutan by Tim Laman via Wikimedia Commons (CC BY 4.0). Editor’s note: William Laurance is a member of Mongabay’s advisory board.